Descent 256 is now available! 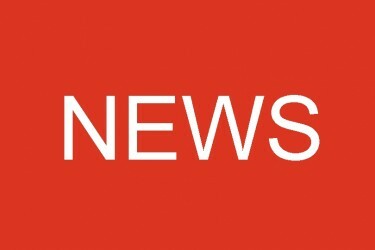 As ever, Newsdesk will bring you up to date with news from around the world. A new species of blind crab has bee n discovered in Meghalaya, India, and the first cave-dwelling fish to be discovered in Europe has been found in the Danube-Aach system in Southern Germany. There’s information on possible defences against contracting histoplasmosis and a fascinating snippet on cold war spying at Postojna Cave in Slovenia. Things aren’t all good, though. Three people were murdered at Easter on a visit to a tourist cave in Mexico and in other depressing news, ancient cave paintings in Chad have been vandalised, and White Nose Syndrome, a fungal disease that attacks bats, is continuing to spread across North America. The BCA AGM and party weekend is fast approaching on the weekend of 9th – 11th June in Castleton, Derbyshire. There’s a packed and potentially contentious agenda for the AGM, with several possible constitutional amendments up for discussion, including the ever-divisive subject of CroW, as well as the question of proxy and online voting. Newsdesk also tales a brief look at how the Equalities Act 2010 might apply to clubs and their activities, and there’s a new report on the cave art at Cueva de Nerja in Spain, which indicates that the paintings might be younger than was first thought. Cave life gets another mention, and the humble harvestman spider is still proving a sticking point for development in the vicinity of Bone Cave in Texas. In news from the north, you’ll find a report on the rigging in Car Pot, along with an explanatory topo. A successful launch party was held for the book Adventures Underground by Dave Haigh and John Cordingly and copies are still available from Wildplaces Publishing, so don’t forget to buy yours while stocks last! There’s been a change of date for the 60th birthday celebrations being held by the Kendal Caving Club, which will now take place over the August bank holiday weekend on 26th – 27th August. Lech Beck Head has been revisited, allowing access to some fine underwater passage. The Peak District bring news of the TSG’s Longcliffe Shaft dig and the first joint BCRA-CHECC science training workshop has been held, with the aim of encouraging students and recent graduates to become more involved with cave science. On Mendip, there’s news of the successful Speleofest held at Easter, as well as an update on the repairs to the vandalised stal in Hunters’ Lodge Inn Sink and a report of possible new management arrangements for the caves in Cheddar Gorge owned by Longleat estates. Mendip says farewell to two prominent cavers, veteran cave diver John Buxton and later in this edition there’s a tribute to Mendip’s ‘adopted son’ caver Tony Knibbs. 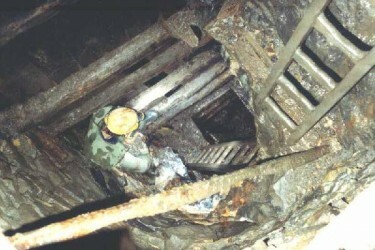 In the same vein, Wales has suffered the loss of mining engineer and caver John Lister. In other news from Wales, a historic tram has been stolen from Aberdare Level, and there are some restrictions in place in the Clydach Gorge due to the construction of a new road. There’s an update on access to the Silica Mines, and work has resumed at Ogof Caci. 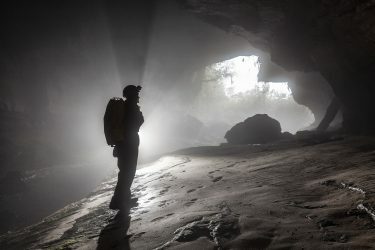 In Ireland, efforts have been underway to survey the high level passages in Shannon Cave, and correspondent John Kelly tells the story of this work. There’s also a survey. In Mines and Mining news, you can learn about the impressive Bear Valley Mine in Cornwall and a recent discovery of some First World War Tunnels beneath Salisbury Plain. The world of mining says goodbye to Ivor Brown, a well-known author on mining topics. And don’t forget that the 2017 NAMHO conference is being held from 23rd to 26th June based in Godstone in Surrey, and hosted by the Wealden Cave and Mine Society. 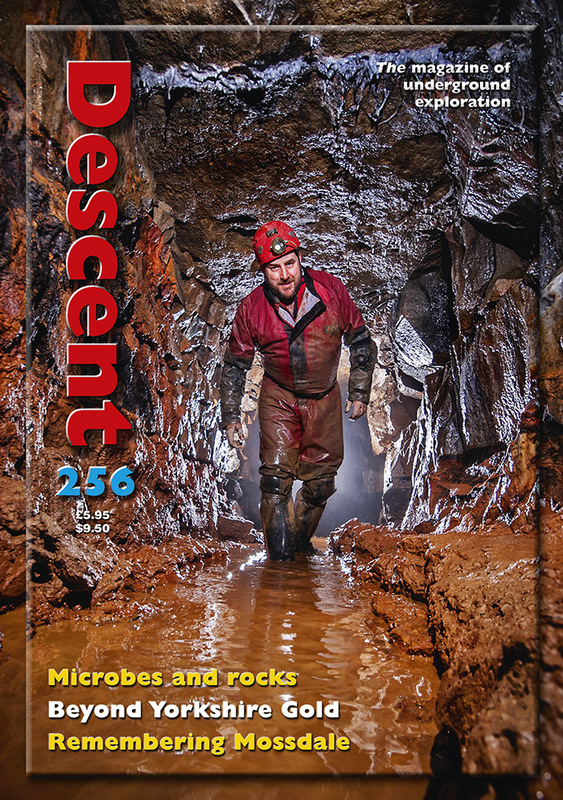 This issue of Descent has a four page feature on Life Under earth, the second part of a caver’s guide to the microbiology of caves with some excellent photographs and a wealth of fascinating information. This month sees the 50th anniversary of the Mossdale tragedy, where six cavers were drowned in 1967. Collette Lord, a member of the original team, shares her poignant memories of the incident and its aftermath. A memorial service for the cavers who died there is being held at 6.30pm on Sunday 25th June at St Mary’s Church, Conistone. Since 2004, members of York University CC have been visiting the Durmitor region of Montenegro. Recent expeditions have pushed ever-deeper and a well-illustrated five-page report tells of their adventures in the area. In Write It Down, an occasional series that presents short caving stories and anecdotes, Philip Judson tells the story of a trip to the Hall of the Thirteen in the Gouffre Berger, France. Caving geologist Andy Farrant challenges cavers to open their eyes to cave science and the caves they visit and tells us a little about the different types of passages we can encounter underground. International News features continuing successes in Mulu and breaks the news of a new through trip in New Zealand. And in Belay Point, Descent’s letters’ page, there are some comments on how the length of caves is measured and recorded. Speleo Reader brings reviews of Adventures Underground by Dave Haigh and John Cordingley, The White Road by Sarah Lotz (a novel which starts in familiar territory for many cavers, cleverly drawing different caves together for her own underground creation), and The Beautiful Adventure a DVD featuring Dan yr Ogof, Wales, made by Andy and Antonia Freem. There’s also a competition to win a copy of The White Road, so don’t forget to try your hand at answering the questions! We’ve said it before, and we doubt we’re going to stop saying it any time soon because it’s true, Descent offers amazing value for money. It is always beautifully presented and jam-packed with news and articles, and this issue is no exception. Copies can be obtained from Wildplaces Publishing here. Make sure a copy lands on your mat every time it appears by taking out a subscription, and also check to make sure that yours is up to date!